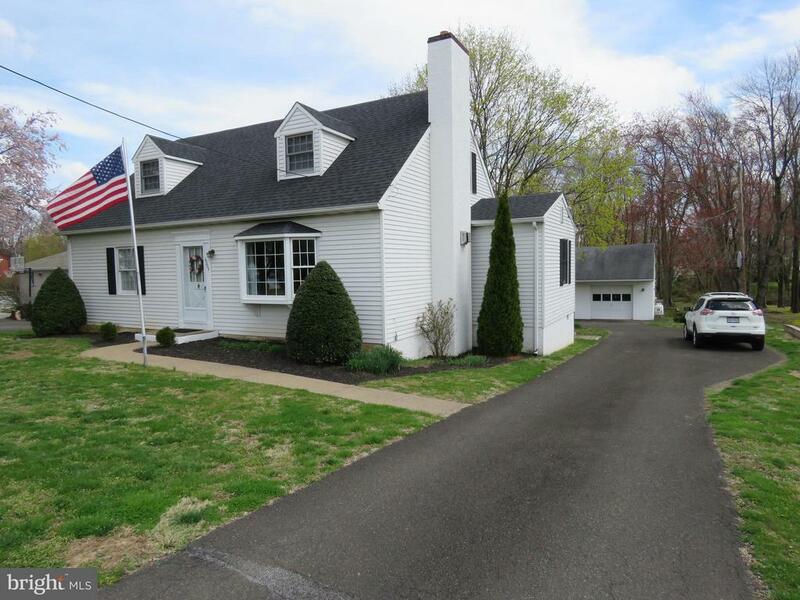 Custom built enlarged Cape Cod on almost 1 Acre lot on one of the most desirable streets in Bensalem. Second level has roof lifted in rear and dormer windows in front. Large screen porch room is 20 x 12 with custom Cedar Plank ceiling. Allows perfect views of park like backyard. Property has stream about 3/4 on back of lot then owns wooded area on other side of small stream. Oversized two car detached garage is 25 x 30 plus 12 x 30 workshop/storage area on back of garage. Double side doors on workshop to drive out on tractor. Garage has electric and heat. Oversized driveway in front of detached garage provides plenty of addtional parking. Enter front entrance of home itself and you are greeted with large living room with stunning Stone gas fireplace with mantel and custom built in bookcases/shelving. Custom hardwood flooring and 7 foot bay window on front. Stairs to 2nd floor have matching oak treads and railing. Living opens to dining area adjacent to Kitchen. Dining area was expended with addition along with 7 x 3.5 walk in pantry. Dining room and kitchen have crown molding. Kitchen has newer flooring and Granite counter tops. Subway style tiled backsplash. Stainless LG Refrigerator. Stainless oven with flat top range. Stainless built in mircowave and dishwasher. Bedroom on main level has 9 foot wall closet with custom solid wood doors. Den is currently used as office but could be 5th bedroom. Large closet with hardwood doors. Good size full bath in hall and coat closet. Will appreciate hardwood floors and matching solid wood interior doors throughout. Custom stairs to 2nd level. Nice size master bedroom with hardwood flooring and custom moldings. Good size his/her closets. New wall to wall carpets in hallway and 3rd and 4th bedrooms. Charming 3rd bedroom is good size and has 2 over sized single closets. 4th bedroom has large oversized closet and double 4 drawer dressers built in wall. Large full bath with jacuzzi tub in 2nd level hallway. Full basement has finished portion that provides oversize family room or recreation area. 2nd half of basement provides small office area, large storage area. Nice size area for washer & dryer with tub. Tank is inside near heating unit. There are bilco doors to rear patio. This home is well cared for. Home is professionally painted and super clean. Great home on very nice lot on great street. Rare opportunity to purchase a home you will cherish for years to come. Directions: Hulmeville Rd (N) to right on Bensalem Blvd. Make right on Washington Lane. Property on left. Inclusions: Stainless LG Refrigerator, Washer & Dryer. (AS/IS)Custom built play set in rear yard.